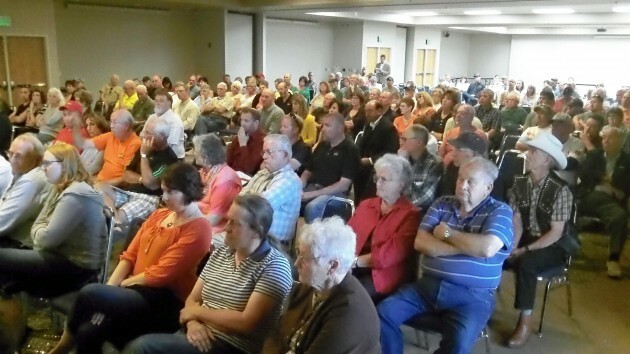 A hearing on the Millersburg power proposal drew a crowd in May. The Millersburg struggle about electric power is about to enter a new phase, one that seeks to get the voters involved. The struggle is between ATI Wah Chang, the town’s main industry and largest power consumer, which wants Millersburg to take over the electric system, and Pacific Power, which does not want to give it up. Three residents now have filed a proposed initiative that would require an election and the voters’ approval before the city council could borrow money, including the millions it would take to compensate the utility for its Millersburg system. Craig Ziegenhagel, an outspoken opponent of forming a municipal utility, announced Thursday that he and two others had filed the proposed amendment to the Millersburg city charter on Wednesday. They would need about 150 signatures — 15 percent of the city’s roughly 1,000 voters — to force an election. The other two petitioners are Victoria Miller and Nancy Lucht. Ziegenhagel tells me it was Miller who came up with the initiative, which is similar to one passed in Albany. “We as well as other members in the community have felt that the City Council is not listening to its citizens. Pacific Power did not suggest this initiative action in anyway,” he wrote in an email. The utility’s regional operations center is in Millersburg. Once the city has approved a ballot title, the group can start gathering signatures. The petitioners are looking for citizen involvement, Ziegenhagel says. People can reach them by email at millersburgresponsiblegov@gmail.com. Thank you HH for keeping us informed on many subjects, but especially on the situation in Millersburg. The DH has not been the same without you! We are willing to help with getting petitions signed in our subdivision in Millersburg.